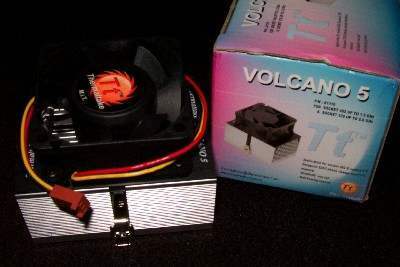 The folks at Thermal Take do not stop when it comes to heatsinks! They've got another slew of coolers available for everybody. This time it is the extension on the Volcano line of socket units. Two new models were just recently released, the Volcano 5 and 6. The unit is recommended for all AMD Athlon 1.5GHz+ and Intel PIII 1.13GHz & Tualatin up to 2.0GHz. This unit does not have the usual high powered 7000rpm fans like the Dragon Orb 3. So right off the bat, this did not seem like the ideal heavy duty solution that some of you may be looking for. It does however, have a slower ball bearing fan which makes this one of their quietest solutions.